Kevin Thompson is an ordained minister who holds a B.A. in Bible from Houghton College (New York), an M.A. in Christian Studies from Wesley Biblical Seminary (Mississippi), and an M. Ed. in Educational Leadership from National-Louis University (Illinois). He has published articles in The Wesleyan Advocate, The Preacher, and Vista, as well as various newspapers. Kevin’s debut novel, The Serpent’s Grasp, won the 2013 BRMCWC Selah Award for Fiction-First Novel. It was also a finalist in Foreword Reviews’ 2012 Book of the Year Awards (Science Fiction category). He and his wife, Cindy, have three daughters, two sons-in-law, and five grandchildren. They reside in Florida. I’ve always had the “itch,” I guess you could say. That was satisfied some during my college and seminary days as I had several articles published in various magazines and Sunday school papers. I even had a couple of newspaper articles published after seminary. However, the fiction bug bit me in the mid-‘90s. I wrote a novel called A Case of Deja Vu. It was my first attempt at fiction, and it shows. I went on to write two more novels (one SF novel for my daughter’s birthday and one as a foray into young adult fiction). All the while, I learned a great deal about the craft. Then, in 2006, I wrote the first chapters on a balcony in Cocoa Beach, Florida, which became my 2013 Blue Ridge Mountain Christian Writers Conference Selah Award winning novel, The Serpent’s Grasp in the First Fiction category. That’s when I knew I was on the right track. Just as all good novels include a plot twist, the Author and Creator of our lives often writes in a twist that ultimately blesses us more than our original plan. Have you ever experienced such a “Divine Detour”? How much time do you have? As Indiana Jones said, “It’s not the years. It’s the mileage.” And man, have we put on some miles taking detours! We’ve had several, but I’ll highlight just a couple. I suffered a serious accident at work back in 1986 which landed me in the ICU for three days and in the hospital for a total of nine. That detour still raises its ugly head sometimes, but it led us eventually to this next one: When I entered the ministry seven years out of high school. Never saw that one coming. I got accepted into a prestigious college on old ACT scores I didn’t even know were any good. Another massive detour was when my wife was diagnosed with Chiari Malformation in 1999 and underwent two brain surgeries as a result. (Ironically, I am sitting in a hotel room right now at 11:00 p.m. writing this while my wife recuperates down the road in a teaching hospital from yet another Chiari-induced malady which required two surgeries to her esophagus – this weekend’s was surgery #2.) It was this medical issue that caused us to leave the ministry in the mid-‘90s and head back to Florida from Iowa (another detour). Let’s talk about your new book, Triple Time (Createspace, March 2017). Please tell us about it. Triple Time is the second book of my Blake Meyer Thriller series, which has six planned books. It picks up where Book 1 leaves off. When they ask me about the books, I tell people, “Think 24 (the TV show) with a Christian twist.” The series is written like that TV show. When the reader finishes the series, they will have completed a “season” of sorts (which, by the way, will lend itself really well to a teleplay in the near future). In Book 1, 30 Days Hath Revenge, a raging madman by the name of Colin Murphy, who feels betrayed by everyone he’s ever worked with, has been planning an attack against the United States for over fifteen years. The contagion — a militarized form of Bubonic Plague with no known cure — was being strategically planned for an orchestrated attack. 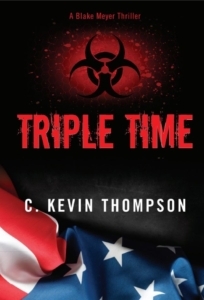 Now, in Book 2, Triple Time, the contagion is still out there in the hands of the enemy. And in a few short chapters, so is Blake Meyer’s family, abducted from their home. However, Blake’s family wasn’t simply kidnapped. They were sold. Sold to three different individuals. And this is where the topic of human trafficking comes into play for the remainder of the series. The clock is ticking now. The chances of finding his family wane with each passing second. So, what should Blake do? He’s an FBI agent, and the contagion is still a threat. He was a soldier in a previous life. Long before he met his wife. And soldier’s go to war against the enemy. But he’s also a father, and his family is missing. And the one person involved in everything — an assassin by the name of Arina Filipov — holds all the answers. Three demands. Three choices. Blake knows what he needs to do, but can he solve everything before it’s too late? For time is literally of the essence, and double time isn’t fast enough. This story was born from a conversation I was having with my wife, Cindy. We both work in education now, and the topic of students being classified as “homeless” came up. As we discussed it, I noted how high school students were taking advantage of the laws in order to prop up an otherwise lazy and unmotivated lifestyle. When they are “homeless,” they cannot be held accountable for attendance, grades, school materials, pretty much anything. Now, understand that for a student whose family just lost their house in a fire, for example, or maybe they got evicted. For those kinds of reasons, it’s understandable. That’s why the law was written. But for a student who simply wishes to be “emancipated” from his parents because he doesn’t like their rules (so he moves in with his best friend’s family), that’s when the law gets abused. Pizza. That’s why I look like I do. It’s always been a comfort food for me, writing or not. Add a Coca-Cola to it, and I’m done for. I would have made the consummate college frat guy. As for the words flowing or not, I’ve never had a problem with writer’s block. Not yet, anyway. I have so many ideas in my idea book, I’ll probably never have that problem. Right this moment, I have two series planned plus a sequel to The Serpent’s Grasp. What I have is a retirement block! I think Joseph of Arimathea. Although I was never rich like Joseph, I was supposed to buy into the family business, and that would have made me rich. However, like Joseph, I kept asking the question, “Is there more to life than this? Or do we just make a lot of money, die, and leave all our goodies to our kids?” And although I hold a somewhat prominent leadership role (I’ve been a pastor, a sergeant in a correctional facility, and now I’m an assistant principal in a middle school) but not as prominent of a role as Joseph did, I know, like him, there’s more to life now than money and position. I think I’d be the sleuth in the deerstalker hat, minus the eidetic memory. Socially awkward at times, has little time for frivolous formalities, and needs to solve the puzzle, whatever form it takes. The game’s afoot, or on, depending on your time period. We don’t have any. I know, to a dog lover, that sounds criminal. We’ve tried. Trust me. It’s simply oil and water. I did have a dog growing up with the most creative name ever. Spot. She wasn’t my dog, though. I just grew up with her. My parents had her before I was born. She was a good dog, and to this day, I’ve never found another Spot. We’ve found Psycho, and Trouble, and Bombshell, and Jaws, and Incontinence, but no Spot. Thanks, Kevin! It’s nice to have you as a guest at DivineDetour. 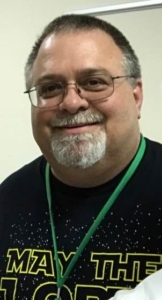 For more information about Kevin, visit his website or his blog.